Duncan Hines Passionate Blogger - Sweet Treats Giveaway! I was recently selected for an exciting new program at Duncan Hines - the Passional Blogger program. Part of the program gave me a sneak peak at the new Limited Edition Frosting Creations flavors that are only available in March 2013. Have you used the Frosting Creations yet? I have used them several times over the last year, and I love the variety of flavors! The new Limited Edition flavors are Key Lime Pie, Fruit Punch, Peaches and Creme and Pink Lemonade. Perfect for Spring! I had so much fun experimenting with all the flavors, and I will be sharing my creations on the blog over the next two weeks. 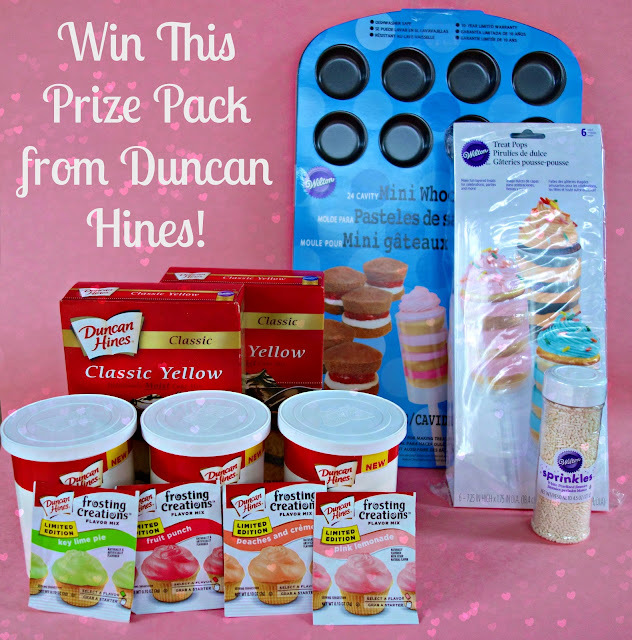 Dunan Hines would like to give one lucky Plain Chicken reader a set of their very own Sweet Treats prize pack! Contest ends March 8, 2013 @ 11:59 PM CST. Winner will be contacted by email and must respond within 48 hours. If the winner does not respond within 48 hours, a new winner will be selected. Good Luck!!! DH is my favorite cake mix, and I've been intrigued by the new frosting. Thanks for the chance to win! I've seen those mix ins, but haven't tried them yet. I can't wait to see what you've been creating. Great giveaway - Thanks for the chance to win. I've noticed a lot of key lime pie items (marshmallows, frosting, cookie/cake mixes) recently while grocery shopping. The flavor sounds like it will be delicious; I'd love to try it! Key lime looks good to me! They all sound great to me. Pink lemonade sounds good to me! Peaches and cream! Great giveaway! Key Lime Pie sounds delicious! I'd have to say the pink lemonade sounds interesting to me. Pink lemonade would be awesome. The lime looks the most exciting to me! Peaches and creme sounds interesting! I would have said fruit punch, but I just can't picture how that would taste on a cake! My husband would love the key lime pie flavor!!! I would like the Peaches an Cream I love good peach flavored stuff. I'm excited to try the Key Lime Pie! I LOVE Duncan Hines product. Very interesting in trying the key lime flavor. The pink lemonade flavor looks really interesting. Peaches and creme! And what's better than cake? oh lovet he idea of all it is so hard to choose on but I would probably choose the peaches and cream. Rafflecopter said to leave a comment about which flavor I like most. Honestly, I've never seen them before, but of the newest four, Peaches and Cream interests me most. I think it would make a great cooking icing or a topper for spice cake. Can't wait to try the key lime pie! Great Giveaway! Key Lime is so right here in florida, but we love peaches and cream! I saw these out in one of our markets but was in a hurry so I didn't pick them up. I would love to try pink lemonade! Kids love these flavored icings! They are perfect for birthday treats. Duncan Hines is a great product! This giveaway is absolutely fantastic! I love your blog and want to thank you for participating in this. I'm thinking Key Lime is what I'd love to try, but they all look delish! I'm anxious to try the Key Lime flavor! I'm excited to try pink lemonade! Key Lime!! But they all sound yummy!! Oh how I love Key lime! I would love to try the pink lemonade! I love key lime pie but pink lemonade also sounds yummy. I think the key lime will be great. What a great giveaway!! I love Duncan Hines!! I would love to try the key lime flavor! Key Lime Pie sounds yummy! I'm gonna have to try that! I think the pink lemonade sounds best! Congrats on the Passionate Blogger...they made a great choice! Thanks for the giveaway opportunity...key lime sounds SO good! Pink Lemonade. But it was really hard to choose! pretty excited about peaches and creme AND pink lemonade! how do you pick just one?! My grandkids will like the fruit punch! Would have a hard time choosing between Key Lime and Pink Lemonade. Both would be great on coconut cupcakes !! Thanx ! This would be awesome! I love how creative the flavors are! I've been waiting for these to be availble in stores!! I can't wait to try them out! Key Lime sounds great! I'm excited about the peaches and cream! It's hard to decide but guess I'd try the fruit punch first. I can't wait to try the key lime! Would love to try the key lime and fruit punch! I would love to try the peaches and cream flavor! Peaches and cream - YUM!! Well don't these sound yummy? I've seen these but I didn't really stop to check them out, which means I haven't tried them yet. Thanks for the chance! Peach sounds delish! I'd love to try them, but as a poor grad student, I haven't had the money to splurge on these treats! i would loooooove to try the key lime, but haven't seen it anywhere yet. key lime is my fav flavor of anything!!! haven't tried them yet, but the Key Lime sounds delish! Wouldn't they be pretty for Easter along side the pink lemonade? cant wait to try the Key lime! I'm most excited about the key lime pie, my husband about the fruit punch! I am totally excited about the key lime flavor!! I LOVE anything lime :)and making lime frosting has sometimes been a struggle, so I am excited to try this! The key lime pie looks awesome. The local cupcake shop has a keylime cupcake that is so yummy. It is one of favorites. Any chance to experiment with new flavors is great. I can't wait to try them. peaches and cream for sure! It would be between the Key Lime and the Pink Lemonade. I would have to try both!!! Pink lemonade! I love anything lemon. The pink lemonade flavor is exciting.....and the fruit punch one sounds so yummy for a summer cupcake!!! My boys would love pink lemonade, and I would love key lime. The Whoopie Pie Pan is too much fun! Thanks for the chance to win. Pink lemonade sounds like spring- which is something I need now during this dreary winter in the east! I bet it tastes as good as it sounds. Peaches and cream, of course! Definitely the peaches and creme!! Yummy! They all look great, but I'm going with pink lemonade! Ooooooh boy, I would love to try the pink lemonade! Thanks for the giveaway! Would love to try the pink lemonade flavour! My oh My do these look delish! I am all about the Key Lime!!!! Love the idea of Key Lime. Can't wait to try it!!! Peaches and cream, for sure. Key Lime Pie sounds good! Haven't gotten around to trying these mix ins yet, so thanks for making sure they're tasty and the giveaway! I'll definitely have to try the pink lemonade flavor first! These look like soo much fun! Key Lime sounds yummy! What a great giveaway. 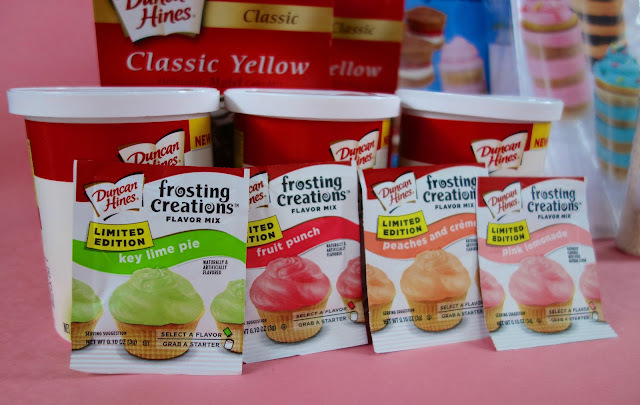 Love the flavors for Duncan Hines and the new Wilton popups. This sure looks fun! I am a DH fan anyway so I bet the products are good! I can't wait to try that Pink Lemonade flavor! I've been wanting to try the Key Lime, even though they all look yummy!!! What a great giveaway. Thanks for the opportunity. Key Lime looks & sounds delish! My son would like every single one of these flavors! I love Pink Lemonade so that would be my first pick but I also love Key Lime Pie so that would be my second pick! Pink lemonade - pink lemonade is my daughter's favorite! I'd like to try the Peaches 'n Cream frosting...yum!! Pink Lemonade for me.......ciao4now64 at yahoo dot com. It's a tie between the key lime and pink lemonade! I'm looking forward to trying Pink Lemonade...YUM!!! SW EET giveaway!!!! Most excited about key lime with pink lemonade running a close second!!! Thanks!!! Great giveaway!!! Another reason to continue being fluffy! LOVE Key Lime so I will go with that flavor -however they all look yummy. Definitely most excited about the key lime! The peaches and cream!!! Yumo!! peaches and cream and I love the idea of the mini-whoopie pie pan!! can't wait to try the key lime. yum! I'm looking forward to pink lemonade. I love the sweet/sour combinations. Can't wait to try all of them...but most of all the key lime! I love Key Lime. What great flavors. I didn't find these locally. I'm jealous and want to try them!!! The Frosting Creations are great for more than frosting - I've used them to flavor some really yummy oatmeal! I think fruit punch would be the most popular with my girls! What a great giveaway! Key Lime Pie sounds yummy! Hey all sound yummy! I think I would tabor the peaches and cream. I just got an error while adding my comment....It's a tie between key lime pie and pink lemonade...Yum either way! Key Lime sounds good. I would love it. I love pink lemonade. That's my favorite, but key lime is a close second. Fruit Punch - I love me some fruit punch! I'm looking to try the Key Lime, but honestly, they all sound great! Pink Lemonade. I have a fabulous pink lemonade cake recipe!! I've not tried the mix-ins yet, but have wanted to. Great giveaway! I have DH frosting creations in apple of some sort. Would love to try the Fruit Punch or Peaches and cream!